These new Regulations of 1979 brought in other factors as well as an updated form of notification from the Surveyor to the Manager and HQ personnel, regarding approaching potential hazards. This together with a plan etc was forwarded to the Mines Inspector, for his approval. Union involvement became a standard procedure with discussions of all approach notices to be sent, with the NUM (National Union of Mineworkers), and later with the UDM (Union of Democratic Mineworkers), and also with the Officials union NACODS (National Association of Colliery Overmen, Deputies and Shotfirers). A folder containing all the mine workings with all the proposed development and the various hazards, together with overlays of the surface and supplemented with all kinds of allied information, and an ‘in depth report’ was prepared by the Surveyor. The report and folder was called the Risk Assessment Folder and was updated yearly, and any new or old information coming to light from any source was added. Following the Lofthouse disaster, after an appeal by the NCB, many old plans and books were sent in by the public, and these were referenced, examined and kept at the Mines Records Office for the district. Visiting Keyworth and cross-checking by staff at the British Geological Survey was carried out, (previously at Leeds). At the older pits it was important to look through the old survey notebooks for any reference to such and at Teversal this exercise was carried out. Again this was time consuming. For any new mine sunk after 1 July 1948, many other factors have to be taken into consideration, and generally leads to a Public Inquiry these days. The Mines Administration Package of the 1990s. As you can see, there is a strong case of legislation, followed by public opposition against coal mining, either by shaft, adit or opencast. It is only by complying with the mining laws, the national and local bye-laws etc, that any new mine can even be started. The environment and public opposition play a large part in the planning of a mine today. Even so, in the past, in 1968, public concern over the proposal to build tips and slurry lagoons on a green-field site next to a housing estate, at Sutton Junction, caused the closure of Kirkby Summit colliery, which had three shafts and two surface adits, and over 2,000 men working several seams and was destined to be one of the largest mines in Europe at the time. The colossal sum of £4m at the time had just been spent on a major reorganisation and new coal preparation plant. Severn Trent and the National Rivers Authority would not allow further mine water to be discharged into the already polluted River Erewash some years ago at Bentinck colliery, and an expensive major scheme to pipe the water underground to Annesley, raise it up the shaft and pump it over 10 miles to the River Trent had to be devised. The scheme was necessary because water from old pits surrounding Bentinck needed to be pumped away to allow the Annesley mine and others to carry on working. In January 1999 the company owning Annesley announced that the mine would be closed in September 1999. The mine water-pumping scheme would need to be revised, or even abandoned now that the collieries in the area to the lowside are closed. The Coal Authority, with its HQ at Berry Hill, Mansfield was set up in 1994, to issue licences, deal with water and subsidence claims. 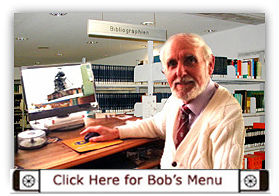 Computerisation with updated software in 1998 has assisted in improving the output of information. British Coal, which came into being when the name was changed from the National Coal Board on 1 May 1986, and the Act was passed in 1987, ceased to exist as from 31 December 1997. The Board of Trade is to deal with any outstanding jobs that British Coal failed to deal with. RJB Mining took over the running of most of the English collieries from 1 January 1995. UK Coal took over most of the English coal mines from 1999. In total the number of collieries now is 5. When the NCB took over the running of the mines on vesting day 1 January 1947 there were close on 1,000 pits plus some 400 small licensed mines. In 1913 some 3,024 mines produced the record output for British mines at 287.4 million tons. A lot of the work involved with the above legislation is done at the HQ of the new firms, as it was at the HQ of British Coal. Of course as mentioned earlier, it is still possible to make mistakes, even with all the checking and cross checking, although they were very few and far between and usually no one else knew. As we all know, one learns from mistakes, and Surveyors are certainly ones to make sure that they never make the same mistake twice. As one colleague stated at his retirement party when he was told by the Chief, who had known him all his working life, that he knew all his faults and mistakes, he said jokingly, ‘ You don’t - some of them are behind stoppings’! From above we always used to say…. ‘a Manager at a pit buries his mistakes in a packhole or behind stoppings, electricians and mechanical engineers bury their mistakes in a skip and a Doctor - he just buries his mistakes, but Surveyors’ mistakes are there for everybody to see’. But as we started out. When all of the above has been sorted through and checked, the line on the front ripping lip can be extended confidently, knowing that it is correct and following the Layout Plan as agreed and signed, and that the utmost safety has been borne in mind. As will be seen many could not operate without our help. Surveyors are self-motivated and it is a statutory post and no mine may be worked without a Surveyor but most of these jobs had little or nothing to do with surveying. Generally to start with the Manager - he could and often did ask many questions on a variety of subjects and would expect an almost instant answer from size of faulting encountered e.g. to what will the seam thickness be in 6 months time e.g. In my case at Ollerton the Manager Walter Standage (for 13 years) relied on me to go to various collieries or works etc and observe and write a report for him as I saw it, irrespective of the mining or engineering side. Similarly for the previous Manager Dave Rodden (for 2 years) who noticed the vast improvement in standards which led to improvements in the efficiency of the mine. Otherwise they left me alone and only responded when I took a situation or a proposal to them. I doubt very much that the Managers who followed would have been so co-operatve. The Deputy Manager could continually ask for answers to obscure questions and require numerous stupid bar charts etc and future planning some years in front when he would have left to go to another pit or been promoted to Manager. This meant a different set of answers for the next one. Most of this information would never be used but took up the Surveyor's time. The Assistant Manager would require Support Rules etc for development, distances, positions of various equipment related to same. The Undermanager would require various check lines for face straightness, panzer creep and advice how to correct it, coal and floor dirt sections, apart from gate lines, lengths of roadways for manholes, gate crush, floor lift etc. Various information regarding distances for haulage return wheels to keep within the prescribed distances agreed. Support Rules for special jobs etc, etc, such as a mid-face machine repair. Distances to go for progress of faces and heads etc and notification of any pillar work, interaction from other seams either below or above, faulting etc so that extra supplies of timber etc can be ordered and delivered. Information required weekly for payment of contracts for faces and headings etc. Every Monday morning at Ollerton the Admin Officer, Union man, Cost Clerk (and Undermanager's Clerk) would meet to agree on the measurements supplied by us to allow wages etc to be calculated. My team of linesmen came on at 4am on the Monday morning and would split up into teams and phone out the measurements to my Surveyor's Assistant (WPIS) by about 9.30 to 10.00am. As well as the total advance for faces and headings the following would be measured also..... last arch and relative offset if any to centre of arch, back of panzer, coal face. Offset to AFC sprocket from gate centre line, gate centre line to centre of first chock at each end of face (number of chocks on face are at a fixed distance so movement denoting panzer creep as well as the sprocket measurement). End of supplies dump, arches, rails, front of switchgear and any switch house (for Electrical dept), haulage return wheel (for Mechanical Engineer and Undermanager), end of rails and last manhole position (Undermanager), ambulance tin with stretcher, stone dust barriers, last water hydrant and methane boreholes drilled that weeketc. Measure any fault size and position relative to chock number, similarly for any swilley with gradients taken with a clinometer, note whether the face is bent and inform so that a check line can be arranged. Sections of the seam and dirt thickness at gate ends. Usually more sections were taken when doing a check line through the face when the machine and panzer conveyor was standing. Shotfiring patterns for headings or faces. Distributed to Overman, Deputy etc. The Mechanical Engineer (or his staff) required lengths and gradients and other information to order the right equipment such as haulage engine sizes, conveyor motors etc. Pumping information etc would be required, such as make or area and amount of water, and lift and length to the next pump or sump etc. Maybe the heights of buildings, chimneys, gantries. It was expected that pit manufactured equipment and numbers such as special arches, swan necks and turn outs etc to be drawn out. Estimates for ordering amount of steel etc. The Electrical Engineer would require a plan to be made for Introduction of electricity into new development areas and nominally require distances for ordering lengths of cables etc for faces, gates and shafts etc. The Surface Superintendent could require areas of tips, demarcation areas and colliery curtilage, gradients of tip, areas of reclamation such as grassing and tree planting, slurry pond life given rate of input, areas and calculation of coal stocking heaps, gradients of rails etc, culverts and pumping, outflow into stream etc. The Cost Clerk (Accountant) / Admin Officer / Union Rep would require weekly face advances and heading / drivage distances for payment of wages. The Safety Department would want various copies of Support Rules. In my career regarding method of work invariably I had to make it up by asking the official or men on the job or using a previous known example. Various Notices for other departments, Fire & Rescue information on a regular basis to display at the relevant positions. The Rescue Station would require regular updates of the Rescue & Firefighting Plan and particularly any changes of ventilation. In this case a copy is delivered to the Rescue Station as soon as practicable. (I used to take a copy in on the day the information was given to me). Regarding an Emergency...fire, explosion etc...the Emergency situation would come into force whereby notices depicting various offices would be hung by the Surveyor. For example the Manager's office would be Control centre overall. The Undermanager's office as underground control. The Survey office would remain, in order to measure / or construct a plan of the incident and take copies for distribution, but other offices would be taken over by Area personnel, police, press etc, etc., even a room or garage to act as a temporary mortuary. Door notices made in readiness should an incident occur. The Ventilation Officer would require various information re distances, positions for air measurements etc and plan updates re ventilation changes etc such as thirling positions, degassing areas and stopping sites positions. The Dust Zone plan area would be required for zone lengths and position where samples were taken for Laboratory use and a Mines Inspectors sample position. Similar for position of each borehole and plotted on a plan whether for tapping water, gas, methane drainage or exploration. A Mines Inspector would require various measurements and other information regarding his visit to the pit so that he could write his report of the visit. The Surveyor (and /or Assistant) would be required to measure up every fatal or serious accident or incident (on 24 hour call) and produce a plan and copies for Pit based and Area based staff and the Mines Inspector. The Surveyor would accompany the Manager to attend any inquest on fatal accidents and supply or answer questions on the accident if necessary. Later would probably have to supply information and plans to the Claims Inspector for compensation claims. At Ollerton I was the Manager's right hand man and always sat in that position in meetings. Only the Manager and the Surveyor would attend the Strategic plan meetings at Area HQ and similarly for the Signing of Mine plans, i.e. Yearly, 5 year and 10 year proposals. These plans were constructed by the Planner after vetting by the Surveyor and Manager first. The Planner would come to the colliery with the proposal and the Manager would ask me to peruse it first before he signed it. The Planning department had up to date progress plans sent to their HQ office every week. They could not operate without these. Information would also be passed on to the Geologist. Information would also be correlated for the Survey department at HQ. Information for the Subsidence department. There are other people at a mine to deal with, such as Overmen, Deputies etc and many more. As one can see the list is endless. The one thing that Surveyors had no control over was money. All departments dealing with budgets etc were always classified in higher grades but as seen they needed help to exist. I hope that these notes will give you an insight into the very complex, but very rewarding job of a Surveyor. There are not many jobs where there is such a variety. One can be in the sunshine one day, the snow or rain another, in the office or a meeting another, or down the pit in the dust and heat another, but it is always very gratifying to know, that the part played by the Surveyor, from helping to plan the job, mark out the start lines and maintain them, then see a scheme come to a safe and successful conclusion, is reward enough. As one of my old tutors used to say, ‘neatness is essential for a Surveyor’, so was the satisfaction in knowing that the job in hand had been done to the best possible standards, and that the door to the Surveyor’s office was always open to help anyone who came through. Generally after the hustle and bustle of the numerous jobs found for the Surveyor to do, by all the various departments at a mine, it was always nice to get down to the job of ‘surveying’. When we are wrong, no one forgets. “Surveyors generally are self motivated”, said John Northard, Retired ex-Director and Deputy Chairman of British Coal, whilst I was in conversation with him in 2010 whilst we reminisced about past times and the ultimate demise of the British Coal industry. As a volunteer pensioner carer I used to speak to him annually, around Christmas time, to enquire of his health and possible needs, as I did for others, as he was on my list of retired members of the British Association of Colliery Management Union. After initial mining training from Dec 1952 - Apr 1953 at Silverhill training school I was awarded a clock at Bentinck Welfare for being the best trainee of the session. I began my career as an Apprentice Surveyor at the Teversal Sub-Area Office, of No 4 Area of the East Midlands Division of the National Coal Board in Apr 1953, where I gained experience at Teversal, Silverhill, Pleasley and Sutton collieries, in all aspects of surveying, qualified as a Mine Surveyor and was appointed as Assistant Surveyor at Teversal. After 3 years post-certificate experience as Senior Assistant at Teversal, where I had spent most of my time, I was asked by the Area Chief Surveyor, Arthur Morley, to move to Ollerton in Feb 1971 and was promoted to Surveyor for the mine in Oct 1971. 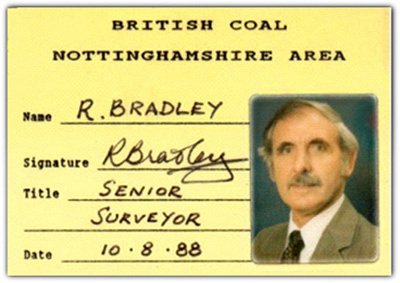 I was promoted to Senior Surveyor at the HQ of the Nottinghamshire Area of British Coal in Sep 1986 where among many other tasks I oversaw the work of all colliery Surveyors, apprentices and visited all mines. I was appointed an MQB/JEB examiner and attended exams at Linby and Edwinstowe HQ. I also tutored all existing apprentices and set mock exams for them and it was gratifying to note that they all passed their mine surveyor’s certificate at the next examination. In 1989 I accompanied the Inland Revenue Surveyors to half of the mines in the Nottinghamshire Area along with a Mining official underground and on the surface with an Estates Surveyor in the re-valuation of the collieries in readiness for privatisation of British Coal. In 1990, when I was made redundant, I was requested to return to work to write an in-depth water report for the Nottinghamshire Area and Midlands Area/South Yorkshire involvement at the various administration borders. I later went on to tutor Survey Assistants at Lound Hall Training Centre whilst contracted by British Mining Consultants. The demise of the coal industry curtailed any further courses although I was offered work in India, Iran and China as a Consultant but declined all 3 as there was no doctor at any of the mine sites and I was concerned about the possible after effects of the local meals! When I started work in December 1952 aged 16, for the princely sum of £2.15s.0d (£2.75) per week, the post of an apprentice surveyor was superannuated from age 20 and there was a ‘no striking’ clause in the contract upon appointment, nor were any hours of work laid down…. ‘at such times as necessary, as laid down by the Area Surveyor’ being the only reference! The joining of the union in April 1953, the British Association of Colliery Management (BACM) was encouraged and I became a member, and upon finishing work became a life member and later a volunteer with the Pensioner Carer Scheme which has allowed me to keep abreast of the happenings in the industry - or what’s left of it! BACM / Team union joined with Prospect union in Oct 2014. At this date the Eckington Moorside drift mine, in Derbyshire, closed for a time in 2013 following a court case against the owner, was reopened in 2014 under new management. There are 2 small drift mines working anthracite in South Wales, Unity and Aberpergym. Also there is a small mine in the Forest of Dean. 6 Opencast sites are in operation (including one in Leicestershire) and 3 working deep mines. Harworth (UK Coal) in Nottinghamshire was in mothballs awaiting a buyer since it was closed for production in Oct 2006 but in mid November 2014 both shafts were abandoned and capped. Hatfield Colliery (Hatfield Colliery Co) in South Yorkshire closed suddenly in June 2015, due to lack of orders. Kellingley (UK Coal) in North Yorkshire is planned to close in December 2015 and this will be the last deep mine in Britain. Thoresby, the last pit in Nottinghamshire closed in July 2015. My task to document every mine in the counties of Derbyshire, Nottinghamshire and Leicestershire is ongoing and has been for 60 years. Hopefully my life’s work will still be referred to in the future as it is today.